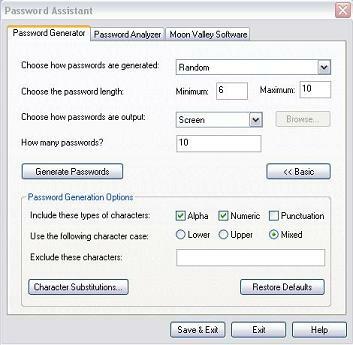 Password Assistant Check your current passwords & generate new, strong passwords. For home or business, small company or large corporation. New Passwords are generated using Dictionary, Pronounceable, Random words types. Optional settings for variable password length, character types, case, exclusions, substitutions. & number of passwords generated. Current passwords are analyzed for security & efficacy. Get feedback on how to make them better. ...... Numerous options assist you in generating passwords that are easier for you to memorize featuring; Dictionary based and Pronounceable passwords in addition to Random word types. Use optional settings for variable password length, use of character types Alpha (Letters), Numeric (Numbers), Punctuation (! , ? . + etc.). Mix it up with case variations; all upper case, (Capital letters), lower case, (small letters) or mixed case, (Both upper and lower case). Use character exclusions and substitutions to avoid common password flaws and trip up brute force attempts to break a password. With character substitution you specify characters that will replace others and are easily entered and maintained to periodically alter your mix. PasswordZilla is a powerful password and hash generator for any your projects. Lightweight, feature-rich password manager. Secure, easy to configure and use. Manage your passwords easily and securely. Never forget your passwords again! Qweas is providing links to Password Assistant 1.0 as a courtesy, and makes no representations regarding Password Assistant or any other applications or any information related thereto. Any questions, complaints or claims regarding this application Password Assistant 1.0 must be directed to the appropriate software vendor. You may click the publisher link of Password Assistant on the top of this page to get more details about the vendor.